Touch Of Belle : Company Awards - Best International Blog - Newcomer! Company Awards - Best International Blog - Newcomer! 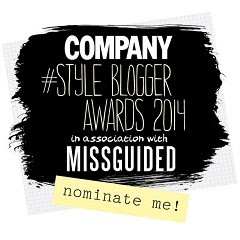 I've seen a few people entering the Company Style Blogger Awards and even though there are so many amazing blogs, I thought I'd enter! If you'd like to nominate me I would really appreciate it! I'm running for Best International Blog - Newcomer (less than one year blogging) so if you do take the time to vote then please click that as the category to put me under! My blog URL is http://touchofbelle.blogspot.co.uk/ Thanks again if you do want to vote, the link is below! Click Here to Nominate me!